Never really been a high heel kind of girl? Do you trip just thinking of the word stiletto? At your wedding you want to feel beautiful, but you also want to be able to walk! Check out some of these unique alternatives to wearing heels in your big day! TOMS shoes have grown really popular over the passed few years. With their policy of "One for One", which provides a child in need a pair of new shoes for every pair purchased, the company is one that is based on a great cause. With TOMS Wedding Collection, you can walk down the aisle wearing their comfortable flats! Their collection includes shoes for the Bride, Groom, Bridesmaids, and Groomsmen, and come in a variety of colors and materials ranging from silver sparkles to black leather. 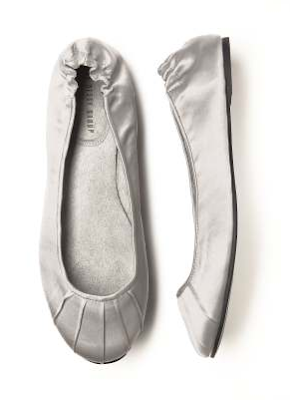 The Dessy Group has designed a collection of Wedding Ballerina Flats that any girl could glide throughout the room in. Created in a soft satin material, with a stretch elastic back, these shoes are definitely something you can wear again! The best part is, The Dessy Group offers them in 18 colors, including a variety of white shades to complement your dress! 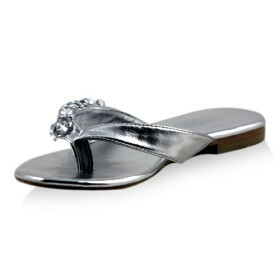 If your wedding is taking place during the Summer months you have the option of wearing a sandal. Light In The Box offers a great variety of wedding shoe styles, and includes plenty of flats and sandals for Brides to choose from. With all colors and shapes available, you will definitely find a comfortable shoe for your big day! So if you are dreading the thought of putting on uncomfortable four inch heels for your walk down the aisle, consider all of our other options. Just because these shoes don't have a heel doesn't make them any less elegant or special!